There is a rather common misunderstanding that tends to happen among those who are drawn to the study of nonduality. There can be an opening or realization that happens at the level of mind. There is an emergence of real wisdom, but it has not yet penetrated down into the heart. This form of intellectual awakening can be cold, dry, distant, and quite often carries a nihilistic tone with it. Such a one can also be quite judgmental, demanding, and rude – often telling others that they are getting it wrong or doing it wrong. Of course all great teachers, masters, gurus, sages, saints, and mystics will have a strong element of deconstruction present in their work with others, but it comes from a place of deep patience, wisdom, and compassion – not a demand to be heard or a need to be right. The difference is in the overall presentation. One who is truly awake knows that no one is actually asleep, and yet paradoxically one must be awake to see this clearly. If this is not understood then we could say that the awakening is ‘incomplete’ even though it’s not really ‘true’ in the deepest sense. For the awakening to fully resolve itself, it must enter into and penetrate the heart. It must become the full embodiment of awakeness – of seeing only the Self in all that is and falling in love with the Self as all that is. This love is not intellectual – it is not conceptual. It is the effortless Love of Self that arises when the Self is remembered. People will often say to me that nothing matters, that it’s all a dream, and yet they are still experiencing great inner turmoil, and don’t understand why. This is why! To awaken at the level of mind is beautiful, but ultimately remains unfulfilling. 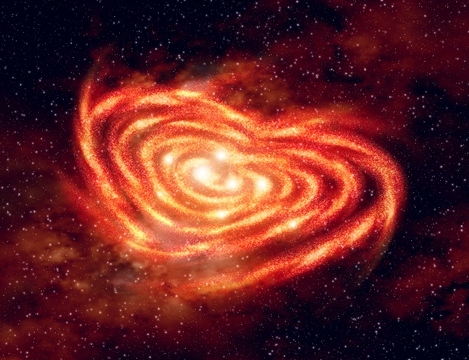 There is a deeper awakening into the Heart that must occur – a deeper sense of Love that must be touched within us. But of course I must also be careful here, because another common misunderstanding is that love is all that matters. If you have not yet seen beyond the conceptual notion of love, then it’s really just the same scenario as above but in reverse. Love is not the issue – Wisdom is; so we work to clear the mind instead of working to open the heart. My main point here is that both Wisdom and Love must be wordlessly present in the immediacy and intimacy of our own direct experience, or we will be like a bird trying to fly with just one wing. Wisdom is emptiness, Love is fullness, and the two are inseparable in awakeness. If we have not yet seen this for ourselves then we may feel lopsided in some way or continue to struggle with some aspect of our experience. It’s good to find a qualified teacher to work with if this is where you find yourself. It’s not that you are lacking anything or have gotten anything wrong, it’s just that a teacher can offer additional pointers to help dissolve or dislodge whatever apparent stuckness remains. It is just the Self appearing to the Self to fulfill the Self, so you really have nothing to lose – except of course your ‘self’. —Bradley Bemis is an Orlando-based spiritual teacher of non-duality and Self-realization, an inner presence coach and guide, and is currently working toward his Master’s degree in Clinical Mental Health Counseling. He offers a combination of public discourses and private sessions for those who are interested in exploring the enlightened insights of nondual wisdom. Working with a living teacher is not like reading a book or watching a video. The teaching is very much a process of deconstruction; a dissolving of everything that supports your belief in separation – your belief that you are separate. In our last session of “The Deconstruction Dialogues” I spoke quite a bit about ‘allowing your suffering to instruct you’. A couple of years ago I also did a talk called “Suffering as Our Greatest Teacher”. This point, on suffering, is so critical, so essential to the unfolding of conscious presence, that it cannot be ignored, set aside, or cast out in favor of another approach. There is no other approach! The journey into awakening is an inward journey of absolute intimacy, of tenderness, of compassion; a way of holding ourselves, and our suffering that facilitates openness and fluidity. If, however, we are guarded against our suffering – quick to dismiss it or to seek escape from it, then we are distancing ourselves from ourselves and negating our own potential to realize who we truly are. The presence of suffering is always inviting us into a form of deep inquiry and examination. Who is it that is suffering, and why is this suffering present? What are we holding onto or refusing to let go of? Most of us don’t like asking ourselves these kinds of questions. We would prefer to turn them outward, blame our circumstances, and demand that they be otherwise. But has this really worked for you? So perhaps it’s time to cultivate a different kind of relationship with the appearance of suffering when it arises. Within the dynamics of this new relationship, we are asked to listen carefully to what our suffering is trying to communicate to us. Many people will say things like ‘I need to find a guru or a teacher’, but the truth of the matter is that your guru, your teacher, is already with you – your teacher comes daily in the form of suffering. You just haven’t been listening to it’s instruction. It is for this reason that you are, in this very moment, being visited by an external manifestation of your own internal need; the need to be told, directly, where to look for the true guru, the true teacher, which is none other than your suffering. If you had a guru or a teacher, would you not show them great reverence, listen carefully, and follow their instructions? Why not then turn these qualities inward, toward your suffering, and become its faithful student? Again, I recognize the challenge that I am presenting you with, and the hesitation that you may feel, but countless masters of the Way, by whatever name, have all been crystal clear on this matter – you must turn inward. You cannot turn inward and avoid what you’ve been trying to avoid all this time, which is more suffering. And so I ask you to be kind, gentle, and tender with yourself; patient and compassionate with yourself – but don’t delay any further. There is such great beauty, peace, tranquility, and love; such great joy beneath it all. But in order to come into direct experiential contact with these qualities of your true nature, you must break free of all that is untrue. And your suffering… yes, your suffering, is your greatest teacher. Please join us for our free weekly online sessions of “The Deconstruction Dialogues” where we take questions from participants and step through them to see where they take us. Just click the image below to learn more and sign up. When I speak on the topic of Love, it is often imbued with three distinct qualities – Love’s cleansing fire, Love’s compassionate embrace, and Love’s playful dance. These distinctions are not ‘real’ or ‘unreal’ in any meaningful sense, but they illustrate the true nature of divine intimacy as it plays out in the immediacy of our own direct experience. Of course, one of the most common questions asked by people of nearly all religious and spiritual persuasions is “if God is Love, then why do so many terrible things happen in the world?” The response is usually a hollow-sounding “the Lord works in mysterious ways”, which is, of course true, but lacking in an explanation of ‘why’. It is interesting to note here that the most commonly held definitions of God are inclusive of a being that is omniscient, omnipotent, and omnipresent. Meaning that God is all-knowing, all-powerful, and all-present; or, put another way, there is nothing that God does not know, nothing that God cannot do, and nowhere that God is not. There is also common agreement that God has a plan, and that everything that happens is happening as a part of the plan. If this is true, which it is, in a way, then how can anything ever possibly be out of alignment with the perfection of God? Here we must return to our understanding that love and happiness are often mischaracterized as being one and the same, and that happiness is the highest goal or ideal of God. That all beings should be ‘happy’ is what we claim. So naturally, when something happens that makes us unhappy, or robs us of our happiness, we immediately judge it as being a mistake or an error of some sort. As something that ‘should not be happening to us’ or to the ones we love, or to other beings at large. It is a terrible thing, a tragedy, a horror – something that God should not allow to happen, and so we then begin to judge God. But if we believe that God, even if we define this term loosely, is the ever-present reality of being, in complete control of absolutely everything, knowing full well what is happening and why, is it more likely that God has it wrong, or that we do? What we must begin to realize, as hard as it may be to come to terms with, is that everything that happens to us, that has the quality of pain and suffering, of difficulty and hardship, is also part of that very same plan. A plan that is completely grounded in Love, as freedom. Not the freedom to do what you want, when you want, the way that you want, but freedom from identification with words, concepts, ideas, models, notions, beliefs and preferences; from the egoic view that things should be some other way than the way that they are. Indeed, our suffering can best be measured as the distance between the way things are and the way that we want them to be. Closing this gap does not occur by wanting them more badly, or by thrusting ourselves more completely into changing our circumstances. It can only be closed through the process of wise acceptance and compassionate surrender. As we begin to slow down and take notice of what is happening in our lives, and we begin to witness for ourselves that all of our suffering can be tied to some sort of fixation or clinging to our own conditioned views and beliefs of the way things ‘should’ be, the more we begin to realize that we are the architects of our very own misery. As this realization takes shape within us, and if we can make space for a deeper truth, we can begin to recognize that Love, in its truest form, is visiting us with the experiences that are required to free us from our condition, confused notion of a ‘self’ that is somehow separate or apart from the whole. The more tightly we hold onto and protect this sense of a personal self, the more we suffer. The more we let go of our conceptual notion of self, the more open, spacious, and loving we become. Cast in this light, in the true light of Love, we start to see clearly that our suffering is actually a manifestation of a deep, profound, loving truth that seeks to burn away all that is untrue. It is quite possible to misunderstand the quality of Love that we might call its cleansing fire, or its redemptive, transformative power. This is where compassion, as another key quality of Love’s true essence must come forth to reclaim the conversation. To say that our suffering is a sign of God’s love, and then to leave it so, would misrepresent the key focus of what is being presented here. It is simply an effort to reframe our experience of suffering so that we can better understand it and allow it to do its work; which ultimately proves itself to be joyful participation in the unfolding of our own lives, from one beautiful unfolding moment, into the next, no matter what the moment may contain. When you can learn to take joy in your suffering, are you really suffering anymore? This is not to suggest that we should seek out suffering in some sadomasochistic effort to become more ‘free’, but rather that a different, more compassionate understanding of suffering can make all the difference in our experience of life. Love knows our pain, our suffering, our difficulty and our confusion. Love understands the impact that its cleansing fire has on our experience of life – and the feelings of sadness, loneliness, and fear that so often accompany that experience. Very little of what we see, out there, in the world, makes sense to us. Why on earth would a loving God, by any name or description, force us to endure such heartbreak. The answer has more to do with who and what we truly are than it does with how we perceive ourselves – and is found in the unitive experience of Being that a spiritual awakening ultimately reveals to us. But until we are able to arrive at that answer for ourselves, Loves compassionate embrace is our refuge – it is the home of the Heart; the gift of forbearance that sees us through the dark times, the hard times, and all of the challenges that come. It is our ability to hold our suffering in our hearts and shine the light of compassion upon it that is the greatest example of how Love is holding us, guiding us, and offering us the solace we need. What Loves compassionate embrace is offering us is an opportunity to sit with ourselves, in ourselves, and watch our hearts break. And rather than question this, push it away, or seek a better explanation, Love invites us into a very different kind of relationship with our experience. It is asking you to be an active participant in its own unfolding. Just know that, whatever is happening; right now; for you; is perfectly in harmony with itself. Just abide in it – from a position of non-judgmental loving awareness; and invite it in to break your heart. Then, notice just how infinite the capacity of your Heart really is. See through the eyes of wise, loving surrender, into everything as your Self; and give it whatever outpouring of love your heart calls you to endure. This can be a movement in your own direction as you struggle to understand why life is the way it is; or it can be a movement in the direction of a loved one, a friend, or even a stranger. So long as we are working to move in the direction of Love, for ourselves, for one another, and for the earth, we can never get it wrong. Breath love, kindness, generosity, gratitude, grace, patience, forgiveness, and compassion into every moment of your life – and do not judge yourself when you fall short of this goal. Just take another breath – and continue on. Eventually this process becomes effortless; as you step across the threshold of doing, into the presence of being. Which is what you have always been, are now, and will never cease to be. The process of awakening to this realization requires you to encounter yourself over and over again, at deeper and deeper levels of Truth; revealing what needs attention, what needs healing, what needs love. It is a process that has no end. The wise do not avoid this fact, they embrace it fully; doing what must be done – whenever, wherever, and however they are called. Just choose love, over and over and over again; until you disappear into it. This is all that you can really do. This is what it means to live in the heart of surrender; the Heart of compassion. Whenever you find yourself reacting to the endless vicissitudes of life, take a moment to slow down, steady yourself, breathe deeply, and drop down into the space of the Heart. Let go of the mental structures and formations – the story that is appearing in the mind and presenting you with difficulty. Drop it all down into the Heart. Drop the mind into the Heart. Just allow them to be there. Fear, uncertainty and doubt; anxiety and restlessness, and all of our painful emotional responses are all qualities of our experience that are born from the unexplored regions of ourselves. It is by shining the light of loving awareness upon them that we begin to free ourselves from them. When we see them become present, and we consciously hold them in the Heart of compassion, we can feel their heat as they ignite and are burned away; again and again at ever more subtle levels of experience. This too is the work of Loves cleaning fire, and although it can be uncomfortable – even intensely painful at times, it is the only method by which one can begin to resolve the unresolved and arrive at true inner peace. The more that we allow Love to do its work within us, the more free we become from the ties that bind us. Love is the current that is guiding us home, and as we begin to flow as one with its calling, it shows us another side of itself. It offers us an opportunity to revisit the childlike wonder and innocent curiosity that once governed our earliest days – that fueled our thirst for knowledge, understanding, and expression – that inspired our imaginations and kindled our dreams. Not as anything even remotely resembling the state of lostness that we are in now, where these notions have a completely different meaning; but in the absence of our conditioned confusion, our misperceptions, and misunderstandings we return to a clarity that is luminous, empty, and infinite – an experience that is unhindered by our egoic fears, desires and efforts to control everything. It is, in fact, Love teaching us how to dance once more – Love teaching us to taste the freedom of Being that we have forgotten – Love teaching us to be true to Love – to be the dance of Love fulfilling itself; something so beyond beautiful that we can barely touch it with words. Most will read this and agree without reservation; see joy jumping in their hearts; feel hopeful tears running down their cheeks; or sense a deep and unfathomable longing to experience this kind of return to Love. This is what we want – what we desire most, and what we demand from the experience of awakening, and yet each of these represents a movement in the direction of denial and avoidance that says “why can’t I just have that?” “Why must I endure so much suffering – why is it all so hard?” But these questions are arising from within a fundamental misunderstanding of who and what you truly are. They are the very voices of pain and suffering speaking. It is for this reason and this reason alone that your pain and suffering remain in place and why Love’s cleansing fire and compassionate embrace remain so necessary to your journey. Until you understand your own true nature, you will be plagued over and over again by forces that are beyond your control; forces that you must first yield to before Love offers you its greatest, most deeply held, most profound gift of all. In other words, one must first crawl through the fires of hell to arrive at the gates of Heaven. To discover that you are already in and as Heaven must be arrived at by leaving everything else behind. This is the true nature of the spiritual journey – taken with absolute earnestness and sincerity. We should not fret over such things though, for Love is always with us. To paint a picture of joyful suffering is to bring a brushstroke of Truth to the scene, but it need not be the final image that we commit to the canvass. As we begin to pay attention to what is happening in our experience, and feel the tightness around us start to loosen, something in our experience begins to dance with us. We start seeing through our fears and Love catches us on the other side, over and over again. The more we relax, let go, and surrender to the current of our lives, the more free we become – and, the more free we become, the more present we are with ourselves and our circumstances. Even amidst the most difficult and trying times, we can learn to take deep joy in the very movement of life itself, no matter what we find ourselves engaged in. We learn how to smile through our tears and be authentic in our experience. Loves playful dance is the result of living in this authenticity. As Loves cleansing fire performs its work, and Loves compassionate embrace holds us close, Love begins to shine through more and more clearly; and this Love consumes us within itself – we become Love at play… we have always been this Love at play. Such a revelation is not arrived at through the various methods that are so often spoken of in spiritual circles though. One does not simply change their thoughts to bring about the clarity that allows Love to fulfill itself in such a manner. For Love to be free, we must step fully out of its way and relinquish ourselves into it. For Love to be alive, we must become its perfect embodiment in the world. For Love to spread, we must give voice to its true nature and weather the storms that will inevitably and invariably result. Within Love’s playful dance, the continued cultivation of patience, wisdom, and compassion – the fruit of Love’s cleansing fire and compassionate embrace, give birth to this new way of Seeing, Knowing, and Being. Here it is known, without doubt or question, that the play is not of our own making, but that of Divine Will, the impersonal impetus of Awakeness as it draws itself out. Indeed, the promised playful dance of happiness, bliss, and joy emerges out of deep surrender; out of a willingness to give ourselves up; out of humble deference to the Whole. Notice here that none of these explanations are consistent with the worldly notion of happiness – which is little more than a passing fancy. Nor does it align with the conceptual notions of bliss and joy that are clung to by the seeking mind, by the suffering separate self. The playful dance is not ‘yours’ or for ‘you’. The playful dance belongs to Love itself, and it will dance in whatever manner it sees fit – not in accord with your demands, desires, or wishes. It is not until you have been cleansed of your misperceptions that you will be invited into the full experiential beauty of the dance. Why? Because it is invisible and imperceptible to one who’s mind is the arbiter of a relative reality which has no Reality to it. And so we return once more to Love’s cleansing fire, where this revelation occurs; and to Love’s compassionate embrace, where this revelation is nurtured. Those who are wise will not make happiness their first goal; will not focus on the acquisition of blissful states, or the joyful exuberance of transient pleasure. Those who are truly wise will sacrifice themselves upon the alter of Love’s cleansing fire, allow for Love’s compassionate embrace to sooth their wounds, and surrender themselves to Love’s playful dance – all on its terms, and not on those of the person who is confused to begin with. There is no other way home to the place that we never left – which is none other than your very own Self. The Continuum of Conscious Awareness is a dynamic model that represents five distinct stages of the spiritual journey. It does not keep us bound to any one particular stage though. As a ‘continuum’, it honors the fluid nature of the awakening process and recognizes that we may move through several different stages over any measurable length of time, be it hours, days, weeks, months, or years. Awakening: When we begin to talk about the true nature of an authentic ‘spiritual awakening’, we may be tempted to believe that this terms has a particular meaning associated with it. Because we already have a preconceived notion, we may prefer to seek out descriptions that are consistent with these notions rather than opening ourselves up to the possibility that it may not ‘mean’ what we think it does. In fact, one of the most challenging aspects of talking about spiritual awakening is the mind’s tendency to insert itself into the dialogue and begin describing what it wants the awakening to be. For many of us, we are fixated on the end result of the awakening process – not on what it actually takes to arrive at it. We want the peace that is promised, the freedom from suffering, the bliss of being; but we want it in pill form so that it’s easy to swallow and offers immediate benefits. None of these preconceptions actually have anything at all to do with awakening though. Awakening is something else entirely. This gentle warning is offered to the seeking mind so that it is prepared to engage in an honest discussion about what an awakening really is. The experience of awakening can be a gradual one, or it can come on all at once, but its quintessential hallmarks are largely consistent across the stories of all those who have been invited into it. They are common enough, at least, to warrant mention. These include the direct comprehension of emptiness and wholeness; not as mind-made conceptualizations, but as an intimate and immediate realization of ourselves as unconditioned awareness. This realization is not the end of the journey however, it is the beginning of a new one – a deepening into the understanding of who and what we truly are. Deepening: Once we have crested the shores of awakening, and glimpsed the fundamental truth of our essential nature, we are properly positioned to engage our seeking activities from an entirely different vantage point. It is the awakening process itself that demands deepening. As we awaken, we begin to recognize that, although we are none other than awareness, our conditioned minds still have a tremendous hold over our experience of life. This conditioned mind is very much akin to an old-style record, with many deep groves in it. If we are to arrive at a culminating point in our experience of awakening, then we must take the time to polish the record until all of the grooves have disappeared. For many, the deepening process is actually the most difficult and challenging stage of awakening. It can even include a more pronounced sense of suffering than before our experience of awakening. During this stage, we are forced to feel everything, investigate everything, and allow everything. The weight of watching our inner and outer worlds crumble can be devastating to the egoic mind, and is absolutely inescapable. We are often drawn into a dance of fear and surrender that requires us to abandon every aspect of our old conceptual world and learn how to become comfortable with a new life of complete uncertainty. Meanwhile we are also called to experience ourselves with such love and compassion that we fall inward towards its invisible center of gravity. As we empty ourselves of ourselves, this love pours in from every direction, completely consuming our old identity and restoring our inherent innocence, wonder, and joy. Eventually something begins to dawn within our direct experience – a sense of wholeness, fullness, and completeness that gives way to the quality of ceasing. Ceasing: For those who have not experienced it for themselves, ceasing is just as difficult to speak on as ‘awakening’. Primarily because within the dawning of ‘ceasing’, there is a recognition that reveals to us we never needed to seek anything in the first place. Even ‘awakening’ itself is a myth. Anything and everything that we have ever read or heard said about the awakening process is seen in a completely new light. We are invited in to the cosmic joke of spirituality, of which we are love’s punchline. There is so much openness, spaciousness, and joy within our direct experience of life that all seeking activities fall gently away into a direct knowingness that all there is to do, has been done; and all that there is to know, is now known. Everything is clear, crystalized, effortless, and simple. There’s no resistance left, only love. We are ‘in the world, but not of the world’. Life goes on, just as it did before, but nothing will ever be the same again because we know, beyond a shadow of a doubt, that we cannot know, and that all is always well. Life is just taking care of itself, as it always has. What we are, just *IS*, and we are all *IT*. It is all *JUST THIS* and our role is to *JUST BE*. Nothing more can be said on the matter. It is a state that would appear as a complete paradox to the mind, but because of the deepening process, the mind has attenuated to a new reality where it no longer needs to know or do anything in particular. It sees itself as a contextual remnant of a dream world, but also sees beyond itself into the sphere of absolute reality. It can hold all paradoxes because it is no longer the point from which life is lived. It can weather all ambiguities because it no longer expects life to comply with its demands. It is from this place that we enter into the infinite last mile. This essay was written as a discussion post for my graduate course in Multicultural Counseling (Jan 2019). As might be expected, spirituality and religion, within counseling, is a topic that is very near and dear to my heart. This week, we are reviewing a case study involving ‘Katie’ and her experience of life through the lens of religious identity (Thomas & Schwarzbaum, 2006). This essay will examine her spiritual and religious influences and then pivot into a discussion about how to facilitate a counseling session that is inclusive of these influences. Interestingly enough, identity and context, which are essential aspects of the human experience (Hays, 2016), are at the very core of nonduality and Self-realization. They were also important to several transpersonal forerunners like Jung (Vienne, Corbett, & Whitney, 2017). This intersection of psychology, spirituality, and nonduality offers an integrative approach that can help resolve issues of identity in cases just like Katie’s. Like everyone who inherits their parent’s spiritual or religious preferences, Katie’s religious identity began as a set of conditioned beliefs (Sue & Sue, 2016). Informed by a strong cultural connection with Catholicism within the dynamics of the family unit, Katie had no real choice in the early stages of her spiritual journey. Eventually though, rote memorization of religious facts became unfulfilling and left her with deeper and more meaningful questions (Thomas & Schwarzbaum, 2006). After marrying her best friend, a gentlemen of Jewish faith, and having children within their interfaith relationship, her entire world was flipped upside down and brought her more deeply into the folds of her own religious persuasion. It also expanded her openness, acceptance, and capacity for spiritual diversification. Indeed, her exposure to another religious viewpoint enriched and enlivened her experience of life in new and unique ways. Altogether, these factors have strongly influenced Katie’s views of life, family, and self; giving them a context that is inclusive of both Christianity and Judaism while honoring, in her own way, that which is most meaningful to her. From the perspective of nonduality, exposure to alternative spiritual and religious views is highly encouraged as it increases openness and receptivity to the undercurrents that are present in every tradition. In fact I am giving a talk, this Sunday, on this very topic (Bemis, 2019). As a counselor, it is wise to be well read across a variety of faith traditions. My own work as a nondual spiritual teacher and inner presence coach is in direct alignment with the core foundations of all esoteric mystical transmissions; including Christian Gnosticism and Monasticism, Several sects of Buddhism, Advaita Vedanta in the Hindu tradition, Sufism within Islam, Kabbalah within Judaism, Taoism, Sikhism, many forms of Yoga, and several other lesser known contemplative wisdom traditions. This broad spectrum of knowledge is incredibly valuable when engaging with students and clients who are struggling with matters of identity and faith. Even more important, however, is true religious experience, or the direct apprehension of nonordinary states of consciousness (Lynn, 2017). It is my experience, and that of all nondual teachers and practitioners of nondual counseling, that direct experience is the most powerful agent of transformation imaginable (Lumiere, 2012). Therefore, if I were to facilitate a session with someone like Katie, I would work with her to examine the core aspects of both Christianity, the actual teachings of Christ, and Judaism, or the Kabbalah’s teachings that are in direct agreement with Christ (and vice versa). As I explained to a friend recently, there are only two ways that we can examine these similarities. Either every contemplative spiritual tradition is working from the same manuscript, or these commonalities spring from those who have come to their own direct, immediate, and intimate experience of themselves as that which is beyond all manner of identification. So in working with Katie, we would gently explore what brings Christianity and Judaism together so that she can transcend their apparent differences and arrive at their unitive core. This may not be a ‘traditional’ approach to counseling, but it is exactly how the nondual-orientation approaches all aspects of the human experience – leaving behind what separates and divides to arrive at that which is inseparable and indivisible. I offer this explanation of my own work as an example of how a counselor’s spiritual or religious philosophy might affect the process of counseling. Because of this, it’s always important to ensure that the client is setting the pace and direction of things, exploring spiritual and religious themes within a comfortable context, and being honored within their selected mode of identification. Spirituality and religion, for many people, are where the very core of their identity springs from (Sue & Sue, 2016). Because of how personal the topic is, it is a delicate subject matter to broach with some clients. Yet, as counselors, this area is rich and fertile soil for inner exploration and the flowering of consciousness. Katie’s story is a common tale that demonstrates the perils and pitfalls of an expanded religious view, but also a story of opportunity and inspiration that come out of this very same expansion of views. In this essay, we have discussed Katie’s spiritual and religious background, described their overall influences, and examined one way that the counselors own views might influence the process of counseling. In the end, everything really is a mystery (Thomas & Schwarzbaum, 2006), but to say “because I said so” falls quite short of the mark. To explain that the conceptual view of reality belongs to the mind, that all concepts are completely made up, and that the deepest truth is impossible to express as a concept, is a much more direct way of engaging in the dialogue. It helps diffuse the mind and begin the radical shift toward the heart that is so common across all such teachings. Hays, P. A. (2016). Addressing cultural complexities in practice: Assessment, diagnosis, and therapy (3rd ed.). Washington, DC: American Psychological Association. Lumiere, L (2012). The Ultimate Secure Base: Healing Insecure Attachment in the Nondual Field. Undivided: The Online Journal of Nonduality and Psychology, 1(3). Lynn, S. J. (2017). Anomalous, exceptional, and non-ordinary experiences: Expanding the boundaries of psychological science. Psychology of Consciousness: Theory, Research, and Practice, 4(1), 1–3. Sue, D. W., & Sue, D. (2016). Counseling the culturally diverse: Theory and practice (7th ed.). Hoboken, NJ: Wiley. Thomas, A. J., & Schwarzbaum, S. (2006). Culture and identity: Life stories for counselors and therapists. Thousand Oaks, CA: Sage Publications. Vienne, B. (2017). Corbett, L. & Whitney, L. (2016). Jung and non-duality: some clinical and theoretical implications of the self as totality of the psyche. International Journal of Jungian Studies, 8, 1, 15-27. The Journal Of Analytical Psychology, 62(4), 622–624. In nondual spiritual circles, we could say that there is a certain range, continuum, or bandwidth of teachings that bring the spiritual aspirant or seeker to full and final fruition. These types of teachings live at the heart of all contemplative wisdom traditions. There is a great commonality across them – which points to an absence, a presence, and living in the presence of absence. Another way that we can imagine this is by looking at it as a journey. This journey takes us up a mountain, exposes us to the view from the top, and then carries us back down the mountain. In Zen it is said that there is a mountain. Then there is no mountain. Then there is a mountain again. In each case we are seeing a very simple arc revealing the full and mature expression of inner understanding. One cannot get caught in the net of the mind, including the net of non-duality that the mind may cling to. If we truly understand this term, and what it is pointing toward, it must, by its very definition, be a completely inclusive explanation of reality. This inclusiveness is what I point to when I use the term Love. It has other dimensions to it as well – but they may express Love in a manner that we are unfamiliar with. I describe these dimensions as Love’s cleansing fire, Love’s compassionate embrace, and Love’s playful dance. All three are dynamic movements within the grand harmony of our Being. When we are ready to pay attention, to really pay attention, we can see these forces at work in every moment of our unfoldment. I would advise those who are of a true heart to become aware of your suffering and study it well. Also study the suffering that you may be creating in the lives of others. Become a student of suffering. As you encounter this suffering, embrace it with an open heart and ask yourself, ‘what am I holding onto here?’. If you look closely, you will see that you are identified with a thought about a person, place, thing, idea, or experience. There is an attachment, or a clinging to views that is present somewhere within the uncharted territories of your unquestioned assumptions. Be gentle in your examination and inquiry though. Don’t stand under the shade of any one tree for too long, or you’ll never feel the sun on your face. Recognize, right now, that this whole journey inward is taking your toward a transparency that reveals the true unitive nature of Life as completely indivisible, always and forever whole; but in a way that is beyond all manner of conceptual understanding. Here, the earnest are destined to come to rest in the fullness of emptiness. This is the place I refer to when I use the word Heart. A Heart that is open, spacious, silent, and still. Traditionally, and empirically, those who find this place often tilt themselves in the direction of service – humble service to Love and Wisdom. It is not always so, therefore do not let this become a trap either, but it is a common occurrence. This means that non-duality isn’t ‘disengaged’ in the manner that the mind may attempt to assert. What we are disengaged from is the mechanics of the mind as the governing force in our lives, surrendering completely into the Heart of Wisdom instead. When I say that this site, Awakening Into Life is about ‘Nonduality from the Heart’, this is what I’m talking about. I tend to keep the focus of our conversations on gently and tenderly letting go of our fear, doubt, and uncertainty – and to test the waters of our own self limitation to see if they are real, or if they have been imposed by a conditioned perception. Is this conditioned perception the truth? Or are we still in the mind? So I’m drawing us down into a deeper dialogue that prepares us to enter a wordless reality that the mind is simply never going to be able to understand. When this becomes clear for us in our own direct, immediate, and intimate experience, and we find ourselves opening up to what’s really here, our hearts become free to honor their full expression. But we cannot bypass the shift that delivers true transcendence. Going up the mountain is indeed challenging and rewarding – and so is seeing the view from the top. But never forget that the last part of the journey takes us back down the mountain again, into the compassionate embodiment of our humanity. This is the fruition of the pathless path, where one crosses the threshold of the gateless gate, and takes their first steps on the infinite last mile. 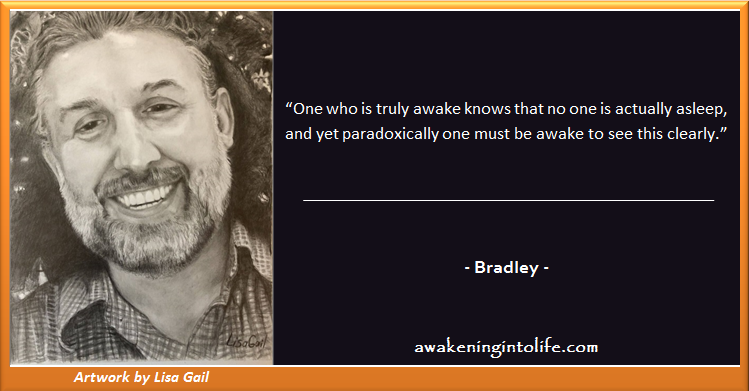 —Bradley Bemis is an Orlando-based spiritual teacher of non-duality and Self-realization, an inner presence coach and guide, and is currently working toward his Master’s degree in Clinical Mental Health Counseling. He offers a combination of public discourses and private sessions for those who are interested in exploring the enlightened insights of nondual wisdom. Learn more at awakeningintolife.com. I am what you might call an open-handed spiritual teacher. There is nothing in my hand. There is nothing hidden from you. You may not like what I’m saying, or prefer a different lens to see it through, but it’s all right here – sitting right out in the open, right in plain sight. When we first meet, I am likely to ask what books you’ve been reading and what teachers you’ve been listening to. This often helps frame our dialogue in terms that are already familiar to you. It also helps me get a sense of where you are in your journey and whether or not I can be of assistance. We may talk a bit about your journey; what you’ve seen and what you’ve realized. I may also ask what you really want out of this journey, what you’re really hoping to gain or achieve. Based on what you say, I should have a pretty good sense of what’s required in the immediacy of our time together. Please keep in mind that when you are working with me, you are working with a nondual teacher who is essentially emphasizing Jnana Yoga – the yoga of wisdom or the yoga of the mind. The central tool’s used within this approach are self-inquiry work and neti-neti (not ‘this’, not ‘that’) discussions with a living master. The entire model is deconstructive in nature so that the fog of the mind may lift to reveal a tender heart in need of attention. Nonduality, at its core, is a dissolving of the conceptual mind and a relinquishing of everything that is bound to it. The teacher knows this and understands how the mind is perceiving the situation, and so the teacher works to guide the mind toward contemplation, observation, and examination until the mind is thoroughly convinced that it has exhausted every avenue except the one being presented. You see, the beauty of Jnana yoga can be summarized in this manner. We are talking about a return to our natural state, and yet we are also saying that this natural state is ever-present – that it’s just about realizing what’s always been true. The question is, what’s getting in the way? If there is something getting in the way, then that some-thing is called mind. What if we show the mind the Truth? If we show the mind the Truth, then the mind becomes a willing partner in the process of awakening. If the mind can see, directly and experientially, without any doubt, it’s true nature and origin, it won’t be getting in the way anymore. It won’t even bother to try. It’s like allowing the compassionate heart to tame the wild mind so that it can be turned in Love’s direction. This kind of awakening is very stable because all potential for instability has been dissolved in seeing things as they are. This kind of awakening can also be very challenging to the mind – especially minds that are already filled with spiritual concepts, notions and ideas. We need to make room for ‘not knowing’ – which goes against every instinct of the mind. Its purpose is to know! One of the main points emphasized, again and again, is how the mind is always trying to control everything. Haven’t you noticed that it’s your tendency to want to be in control of everything that is the greatest sources of suffering in your life? It’s really scary isn’t it? The idea of not really being in control? The mind has to ‘know’ what’s going to happen at all times! That’s its job! What does the mind need in order to ‘know’? It needs information. It needs to learn everything it can about every possible angle of interest so that we can feel safe; always protected from harm. The mind must also be on alert for threats and potential dangers. It must be wary of deception. It must have a firm foundation in a belief or an idea that it uses to orient itself. And it must protect it all! This is, of course, an exhausting way to live one’s life. It is wrought with anxiety, disappointment, and depression; with bitterness, anger, and resentment. You may indeed be a very nice person – and you are perfect just as you are. But if you look closely at the subtle nature of the mind, you can easily see the churning ocean of thoughts that are filtering every aspect of your perceivable experience. Everything is labeled and categorized, given meaning, and acted upon through this lens of thought – through this lens of mind. But what is the mind and where does it come from? And more importantly, who is it that is aware of this mind? Over and over again we will draw you back to this primary point of incursion. Who is aware of mind? Who is aware of body? Who is aware of experience? Satsang… a spiritual discourse or sacred gathering that explores the nature of Truth. Come join us on Sunday, 20 January, for an open discourse on nonduality and its presence in all of the various places that we might look, sincerely, for truth. We will be meeting in the park, at Winter Park from 3pm to 5pm, near the Harp fountain. All are welcome to attend. No familiarity with nonduality is required. Please feel free to bring a blanket or chair to sit on, since we will be meeting in the park. If it is raining, we will be meeting at the Winter Park Starbucks instead that’s just down Park Ave. If you need any further guidance or directions, or have any questions, please feel free to text of call Bradley at 425-233-2571. For the vast majority of us, here we are in our unquestioned experience of ourselves, operating from ‘I-the body’ with the idea that consciousness resides in the body as a function of the brain. We believe that consciousness is the product of various electro-chemical stimuli and that subjective experience is the result. This proposition, from a rational scientific perspective, has no basis in fact though – and is often referred to as ‘the hard problem of consciousness’ by neuroscientists, researchers, and others. When something happens, aren’t you aware of it? Aren’t you aware of the body and its sensations? And what about the mind, or the patterns of thought that appear? Aren’t you aware of these thoughts? What about experiences? Aren’t all of these experiences happening in awareness? If we look, if we really really look, can we see that everything that comes and everything that goes is coming and going within this awareness? Take a look… test this for yourself. If you look, if you really really look, you are likely to see that awareness is primary. Awareness is prior to any of these appearances. Without awareness, these appearances would be impossible. So awareness is primary – and comes before all thoughts, feelings, emotions, sensations, and experiences. Just orienting ourselves in this direction is a profound shift in perception that reveals tremendous space within – space enough to be present with whatever is happening in our awareness without necessarily reacting to life in habitually unskilled and unloving ways. Is this the end of the road though? No, not at all. If we keep looking from this awareness – if we keep looking at what’s appearing within this awareness, we are likely to see that there are all of these thoughts coming and going. Of course, if we haven’t looked – if we haven’t questioned, then we are likely to have a pretty tight relationship with these thoughts. We may be taking them quite seriously, identifying with them, and assuming ourselves to be them. This is perfectly normal, but the fact that it is normal doesn’t necessarily mean that it is accurate. Where do thoughts come from? Take for instance a very simple statement “that dog is brown”. Notice how this thought appears in the form of words, in language. This thought is being spoken in the mind, but it is indeed being spoken. The words that you are reading right now are being spoken in your mind are they not? It may happen so quickly that you don’t even notice it, but if you are looking closely, you might just see that this is true. So here we are thinking to ourselves “that dog is brown”. But is that dog really brown? Is it even a dog? When a thought arises, it is usually arising in reference or relation to something that is happening within us, or in the world outside of us. In the world of objects. Let’s take a moment here to point out that this use of language is learned. At some point in our early childhood we were taught what a dog is and we were taught what the color brown is. As this occurred the information was filed away as an object reference that is recalled every time we see ‘dog’ or ‘brown’. We could say that we were conditioned to see the object ‘dog’ and understand what a ‘dog’ is. We were conditioned to see the color ‘brown’ and understand what the color ‘brown’ means. There’s nothing wrong with this – it makes interaction possible. But let’s keep looking. Before we were introduced to ‘dog’ and ‘brown’, what was there before it? Can you remember back to a time before you were taught the basics of language and meaning? A time when you didn’t ‘know’ what anything was? Think of a baby or a small child. Think of how sweet and innocent a baby or small child is. They are, of course, still interacting with the world. They just don’t have words for anything. Their experience is a direct, immediate, intimate, unfiltered experience of what’s right here, right now. There is a natural honoring of life without the need for a mental model. But then someone taught us that this apparent shape, with these apparent qualities, should be referred to as ‘dog’. That it is a ‘dog’. We were also taught what a dog is, how a dog behaves, what a dog does, and what a dog is for. Suddenly, the infinite potentiality of life become bound up in the word ‘dog’ and the meaning of ‘dog’. The infinite potentiality of life was mentally reduced to dogness. The same is true of the color brown. At some point someone pointed at something and said ‘brown’. Now the infinite potentiality had colors and one of those colors was ‘brown’. And so here we are, talking about brown dogs. It may sound like a silly conversation to be having, but this point – about brown dogs – has the potential to help us understand what a true, authentic, and mature spiritual awakening really is. It carries within it the potential for us to arrive at that which the word ‘enlightenment’ is really pointing toward. Because there are no brown dogs – do you see? There is only the label, the concept, and the meaning that has been handed to us as a way of relating to the apparent world of phenomena. It is how the mind sees – but this is not Reality! Keep looking. Look closely. The words come and go as thoughts, do they not? The thoughts come and go in awareness, do they not? Objects come and go as experience, do they not? The experiences come and go in awareness, do they not? So again we are arriving at this awareness – this awareness that is primary. This awareness that is present prior to anything that may be appearing within it, including the words, thoughts, objects, and experiences that are coming and going within the empty spacious presence of awareness. And remember, everything here is predicated upon the foundation of language. Now we arrive at the beginning edges of paradox, ambiguity, and contradiction – like approaching the horizon of a black hole where the laws of physics begin to breakdown. We have to look closely, really really closely, at our own direct experience. And we have to ask ourselves who is doing the looking? Pay close attention to what happens when you move toward this question with sincerity. Do not be afraid. Love is here, ready to catch you on the other side. Can you actually find anyone there? If you say yes, aren’t you just using the language of conditioning to turn the answer into an object? It’s okay, it’s perfectly okay. This continued mental translation of Life into objects isn’t even really the issue. It’s a habitual pattern that may need some attention for a while, but there’s something even more subtle that we can work with – we can cease believing in our thoughts. Remember, your thoughts say absolutely nothing about the nature of Reality as it *IS*. Your mind doesn’t actually know anything. All it knows are its concepts. The mind does not even realize that it too is just a concept. Look closely, examine your assumptions, and see for yourself what’s really True. Again, let us return to the awareness that is aware of these words. Then let us notice the noticing. THIS. Right Here. THIS is all there is – to notice the noticing – that’s as far as this goes my friends! There are no answers to be found, no explanations, no mystical states of being, no ideas, no beliefs, nothing – there is not one single ‘thing’ here! Only awareness, only noticing. Yet this void in space isn’t where we ultimately end up. This isn’t the end either my friends. If we remain here, at the top of the mountain, we’re likely to remain dry and disconnected. This may be our natural state, but here we must shift again. With no center – and yet still completely here, where can you go? Now we begin to drop down into the Heart of our Being. Not the physical heart of course, and not an object. No. What we are coming into contact with is the very Presence of our Being; the felt sense of Presence that is an immediate and intimate Reality beyond words. We drop down into the heart, breathe deeply into it, and we rest here, in the silence, stillness, and quiet of Being. The mind goes on, life goes on, everything is exactly as before, but now the mind is transparent and radiant, and you have come to rest in the fullness of your Heart! When this realization or revelation begins to take root, we find that our Hearts are infinite and have the power to anchor us in this aware Presence. The two are really inseparable for they are not really two ‘things’. Who and what we are is this Presence. So we are open, spacious, empty and aware, with a mind that has become transparent and radiant, and a heart that has become open and clear. We are firmly rooted in our *SEEING* as the Absolute view, while also encountering the relative reality of the mind, body, and phenomenal world; doing so with great love, wisdom, patience, and understanding. This is my direct experience – what emerges from this KNOWING, SEEING, BEING. I share it with you out of compassion. Everything I do, everything I offer, everything I teach is to shine a light on this profound shift in perception, this paradigm shift that changes everything. Everything that arises from Here is an invitation offered in service. I cannot tell you how precious this understanding is – not to anyone in particular, but to the Heart of Being itself. This is all there is my dear beloved friends. This is all there is. Nothing more. Nothing less. THIS is all there *IS*. May all beings come to rest gently and tenderly in the Heart of Being.